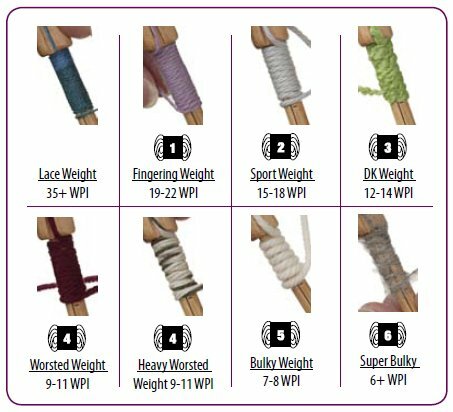 If you’d like to substitute yarn or you are the proud owner of some mystery skeins, the Wraps Per Inch tool could help you greatly. 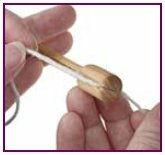 Using a WPI tool can help you to identify the gauge of a certain yarn. For more information about gauge, visit the Gauge topic. Simply grab the leftover yarn you would like to use and follow these three easy steps. 1.) 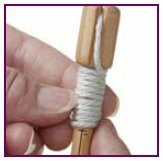 Hold the WPI tool in your hand and slide the yarn tail through the top slit to hold the yarn in place. 2.) 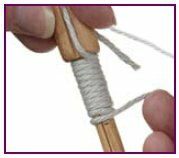 Slide the yarn through the guide and down towards the wooden handle. Lightly guide the yarn around the handle and begin twisting. Continue to wrap the yarn around until you have reached at least the one inch mark. If you are using a “hairy” or “bumpy” yarn you need to allow space between each wrap and may want to continue to wrap to the 2 or 3 inch mark. 3.) When you have completed your wraps, count the number of rows that were created on the handle. If you only wrapped to the one inch mark then the number you have counted is the number you should use on the corresponding reference card. If you have gone past the one inch mark you must remember to count the total wraps and divide by either 2 or 3 depending on where you stopped wrapping. Take the number of rows and move across the top row of the reference chart until you have found a category it will fit in. Check the gauge icon directly above; this is the weight or gauge of the yarn you measured. If you feel you have made an error in your wrapping, just unwind and start again from the beginning. The key to this is not to pull the yarn too tight or too loose when wrapping onto the handle. This entry was posted in Gauge, Reference, View All by Knit Picks Tutorials. Bookmark the permalink.